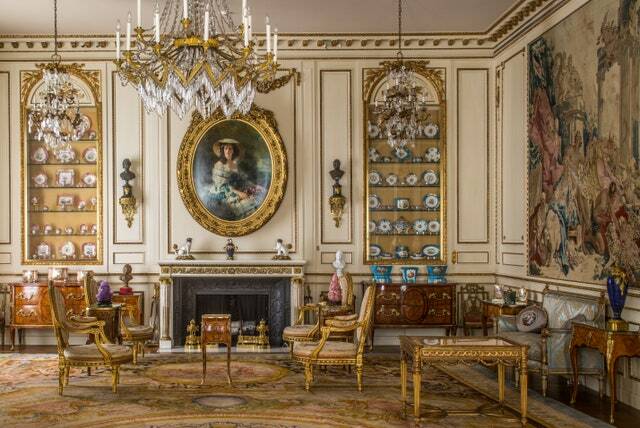 A room at Hillwood, the estate of Marjorie Merriweather Post. It's any designer's dream: sourcing directly from the extravagant collection of one of this country's most legendary tastemakers. For a group of seven lucky creatives, this dream was a reality in The Artistic Table, a new installation at Hillwood, the Washington, D.C., estate of Marjorie Merriweather Post. For the show, Charlotte Moss, Timothy Corrigan, Alex Papachristidis, Barry Dixon, P. Gaye Tapp, and the team of Hutton Wilkinson and Josh Hildreth pulled items from Post's expansive collection of European, Imperial Russian, and Chinese Export tablewares to create six unique tablescapes which place the legendary heiress's penchant for entertaining in a modern context. "The idea was twofold," explains Lynn Rossotti, director of communications for Hillwood, which now operates as a museum to showcase Post's extravagant collections and singular lifestyle. "One, Marjorie was such a phenomenal entertainer. She’d have dinners on this incredible Russian porcelain. So we’re inspired by that incredible entertaining and want to celebrate it. And then on the other side, we wanted to ask, 'How can you use those in a contemporary, fresh way?'" Enter some of today's top design talents, who managed to work their creative magic in six dazzlingly different, yet equally inspiring ways, now on display in the dacha which Post created on the grounds of her estate. Read on to learn about each of their creations. "I just wanted to do something chill," explains Moss (who is on Hillwood's International Council). Of course, "chill," for Marjorie (and for Charlotte), is no paper-plate picnic. And that's all part of Moss's message: "Anyone who entertains, entertains anywhere, anytime, anyhow," she says. "And the message is no matter how nice the things you have are, the important thing is to use them." And use them Moss does, in this setting, which places Post's export China atop table linens, sourced by Moss, at a wooden patio table she found at a small shop in Connecticut. "I tried to channel Marjorie in every step," Moss says. "Even the rustic chairs, I topped with silk covers for that balance." To give the whole scene a firm sense of place, Moss looked to one of Post's other estates, Camp Topridge in the Adirondacks. 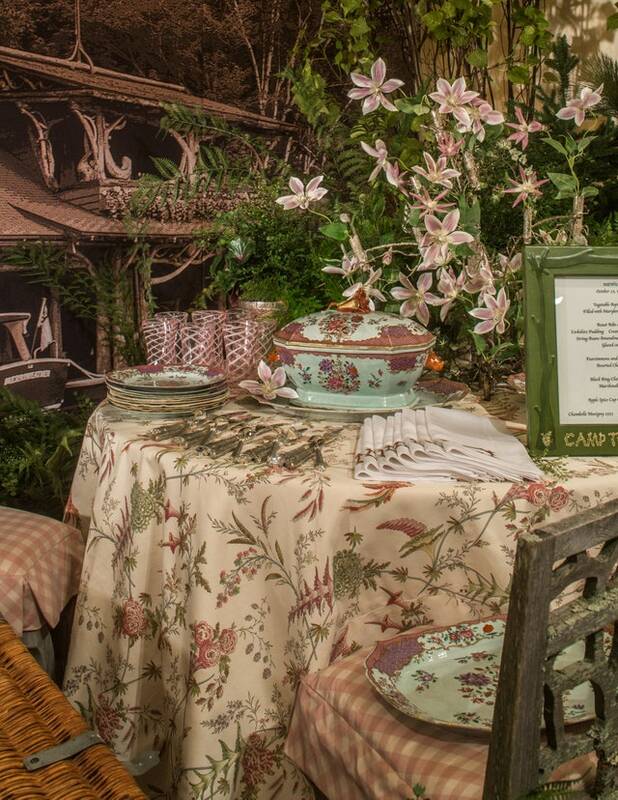 Moss used an oversize image of the camp's cabin as a backdrop for her table and covered the whole thing in a canvas tent. 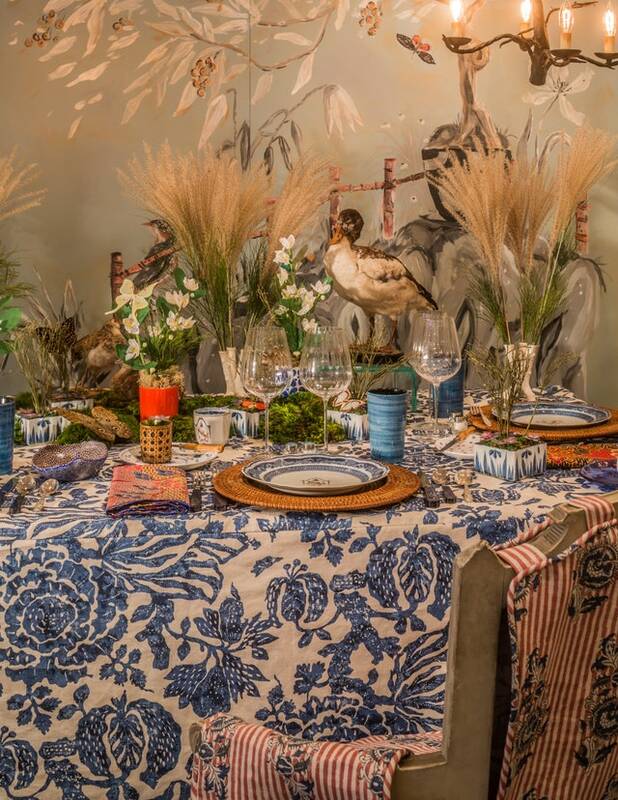 But of course, even the most rustic gathering is incomplete without florals—Moss's are courtesy of Louis Miller in New York (faux, to last the exhibition's four-month run). 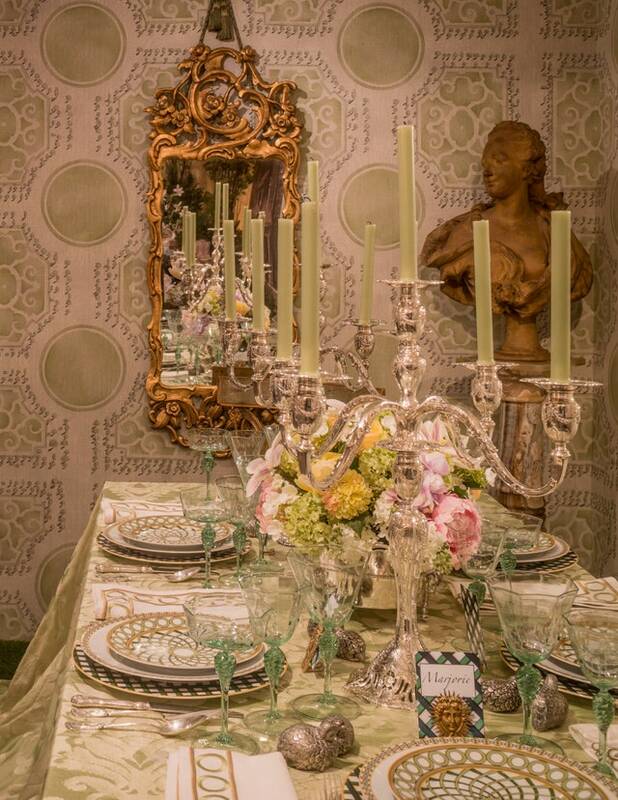 Corrigan's literal centerpiece is a pair of breathtaking silver candelabras from Post's collection, around which he built a French garden scene. "My inspiration was the gardens here at Hillwood," he explains. "I love the greenhouse and the gardens, so I riffed on that using this new wallpaper I designed for Fromental inspired by the gardens at Versailles, handpainted on silk. On the ground I put AstroTurf, and the garden theme continued with my Jardin Français china for Royal Limoges." Corrigan added a personal touch to the tablescape by way of Murano glassware that his grandmother purchased on her Venetian honeymoon. It's the china, of all things, that gives Corrigan's setting the same balance of casual and chic for which Moss aimed: "The best thing about these plates?" Corrigan asks, holding one up with a grin: "They're the first fine china in the world with gold that you can put in the dishwasher and microwave! And I think that’s so important because people have this beautiful china but they never use it because they can’t dishwash it." Marjorie would certainly have been impressed. "I wanted it to be a little bit of Marjorie gone current and modern," Papachristidis says of his table, whose pops of color stem from the floral porcelain he selected from her collection. "So I took a neutral palette and then had Vlad [Kanevsky, the master of porcelain flora] make the flowers. I felt if Marjorie was around today she’d do something fab like Vladimir, who of course is Russian. If Marjorie had known him, these flowers would have been all around Hillwood." Indeed, much of Papachristidis's design hinged on what Marjorie would have done if she were around today. "I approached it as if we were collaborating," he says. 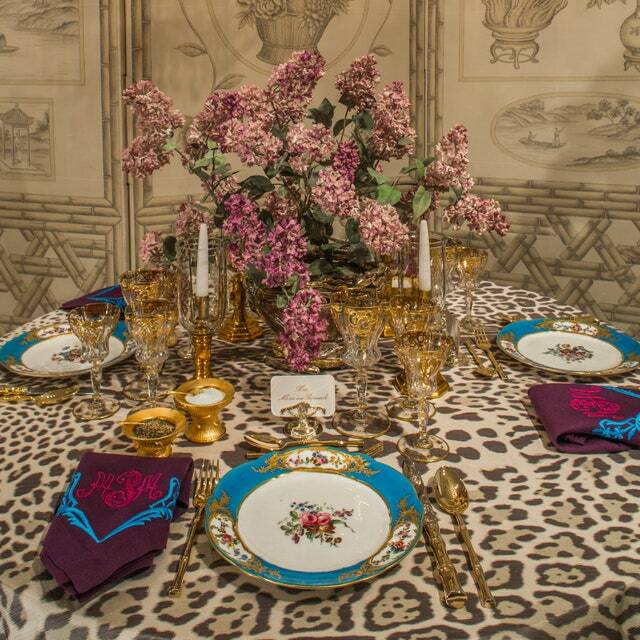 That included using his usual go-to sources, in addition to Kanevsky: Christopher Spitzmiller created custom gold salt cellars, Leontine Linens embroidered napkins, and Papachristidis pulled fabric from his own personal collection to serve as the tablecloth. There was a fair bit of fantasy involved too, though: the guests noted on Post's gold-plated place card holders? Post, Pauline de Rothschild, the Duchess of Windsor, and Mona von Bismarck. "My gals!" exclaims Papachristidis gleefully. "I mean, that's a pretty good group, right?" 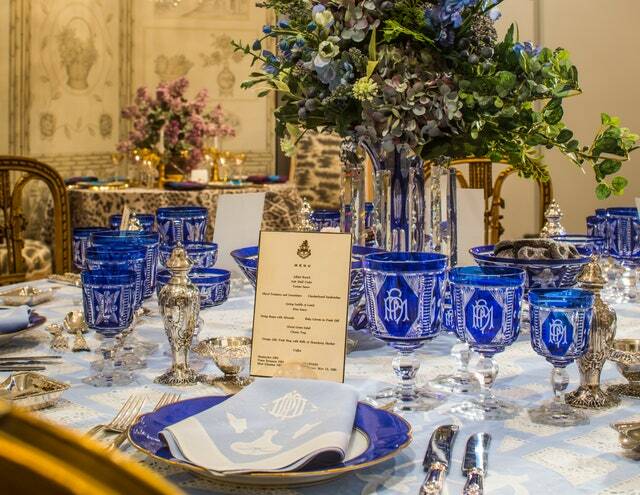 Madame de Rothschild made a second appearance at the table of designer and author P. Gaye Tapp. Dubbed "Le Style Pauline," Tapp's tablescape juxtaposes Post's Chinese export porcelain with modern flatware and glasses. North Carolina–based Tapp is well positioned to speculate on the entertaining style of such stylish women; she's the author of How They Decorated: Inspiration from Great Women of the Twentieth Century (Rizzoli, $55). "It’s only natural that I turn to her legendary Grand Mouton tablescapes for The Artistic Table inspiration," Tapp explains. "Pauline de Rothschild needed look no further than the exquisitely framed eighteenth-century Chinese painted panels in her Mouton bedroom. Those panels might come to life on her table landscapes — petite orchards of wild cherry, or a small forest of branches in cache-pot. My table also takes its cues from those panels and the taxidermy birds de Rothschild had in her bedroom." 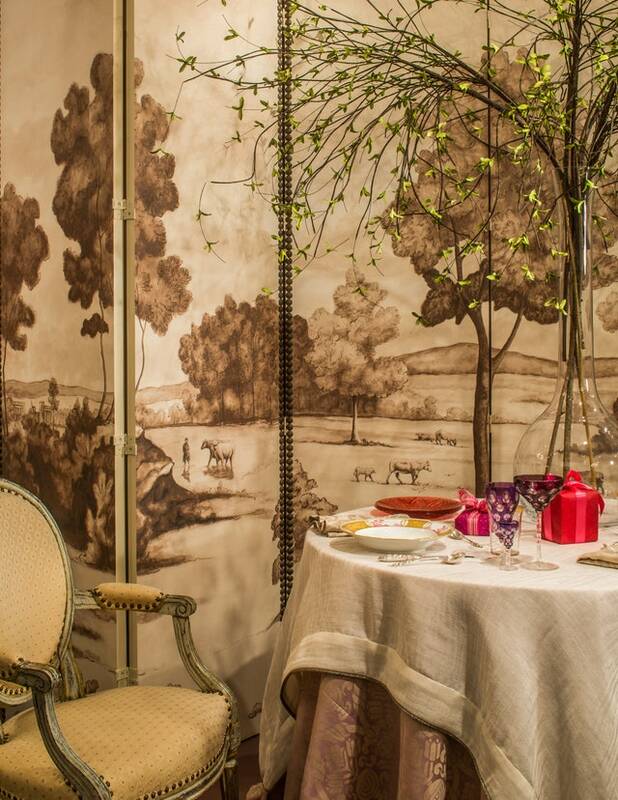 Tapp enlisted decorative painter Jimmie Henslee to interpret de Rothschild's panels as a mural behind her table. When Los Angeles–based Wilkinson got the call to participate, he teamed up with his friend Josh Hildreth, a D.C. local. The result is a multifaceted ode to Wilkinson's late partner, Tony Duquette, centered around a set of imperial Russian china from Post's collection. "This is a bit of Beverly Hills come to Washington," Hildreth explains. For him, the theme of Duquette-meets-Post was a longtime dream to undertake. "As a little boy growing up in Minnesota, things like the interiors of Tony Duquette were such a fantasy," he recalls. "So what you have here is honoring Tony and also the inspiration of Hillwood." Hildreth's decorative starting point was a sunburst in the parquet floors at Hillwood, which he had transferred onto verre églomisé. Duquette's iconic Malachite fabric for Jim Thompson graces the table, which is flanked by chairs from Dragonette covered in Scalamandré's Tigre velvet. "I knew this needed to be bright and vivid and lush and that the tablecloth had to be Tony’s," Hildreth explains. But in addition to the throwbacks and uber-luxe fantasy, "we wanted to include some things people could go out and buy," the designer says. 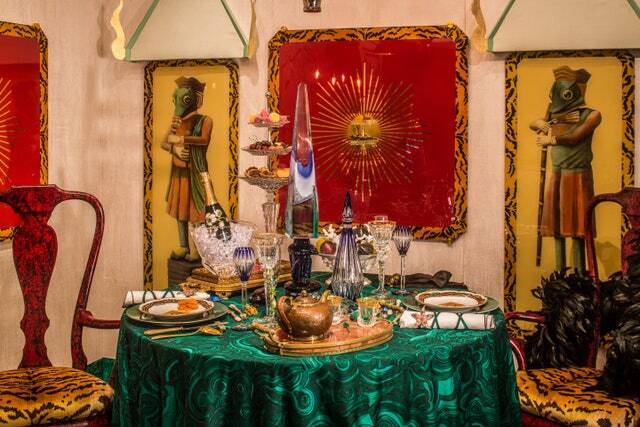 So he peppered the table with items from Seguso, Saint Louis, Baccarat, and more. "Tony Duquette was about layering," he says. "He wasn’t afraid to go to the five and dime, but he also had museum-quality pieces. It’s the mix." "It’s such a pleasure to get to use these things we don’t see every day," marvels Virginia-based Dixon. To highlight the china he selected, the designer opted not to go all out, but rather to use neutral, understated visuals that let Post's treasures take center stage. "We were imagining a romantic dinner for two in honor of Valentine’s Day," he says. He set the scene with fabrics from his line for Vervain and vintage chairs, then added an additional personal note with silverware his family bought in Thailand and heirloom glasses. "I love the idea of my grandmother's glassware sitting next to these incredible heirlooms from imperial Russia," he says. To complement the designer settings, Hillwood's curatorial team outfitted one additional table entirely with Post's collection. Monogrammed glassware shines next to cobalt china, antique silver, and, of course, a historically accurate menu.